Serena Williams was back to her old self in her straight sets victory against Karolina Pliskova in the Bank of the West Classic. STANFORD, Calif. -- Apparently, lounging in the Croatian sun and catching ice cream scoops in her mouth was just what Serena Williams needed to get her game back. Four weeks after her disturbing exit in a Wimbledon doubles match -- and a couple weeks after a relaxing and Instagram-ed Croatian vacation that included video of her catching ice cream at a shop -- Serena took the court at the Bank of the West Classic to a roar from the supportive crowd Wednesday evening. She bounced the ball easily. She tossed the ball up in the air without a problem. Her first serve went -- gasp! -- over the net. And for the next hour, the world's top-ranked player looked much more like her usual self, rather than the woozy, baffling Serena who struggled just to bounce the ball and double-faulted weakly four consecutive times in a Wimbledon doubles performance that left the world wondering what was wrong. Serena maintains that it was a viral illness that was worse than she realized -- "I was really scared'' -- and that she has recovered. She certainly appeared recovered Wednesday when she beat No. 45-ranked Karolina Pliskova 7-5, 6-2 in a match that took 1 hour, 4 minutes. Serena Williams struggled in the first set, but took control in the second to win her first match since suffering from a viral infection at Wimbledon. Despite the awful doubles performance at Wimbledon, plus early exits in singles there and at the French Open, plus several weeks away from tournaments while the world speculated, Serena said she felt completely normal on the court Wednesday. No rust. No nerves. No worries. She definitely played better as the match wore on, as did Pliskova in a close first set when neither player could break the other until the 12th game. Every time Serena won a game, Pliskova came back and won the next -- 1-1, 2-2, 3-3, 4-4, 5-5. "I thought it went pretty well the first set, but I knew I was playing a player who was going to be very difficult to break, so mentally I knew I had to really, really hold onto my serve, even more so,'' Williams said. "That was really important to me to be super focused on my serve. Serena had six aces in the first set (nine overall) and finally broke Pliskova in the 12th game, when the Czech player double-faulted and didn't win a point. The match turned there. 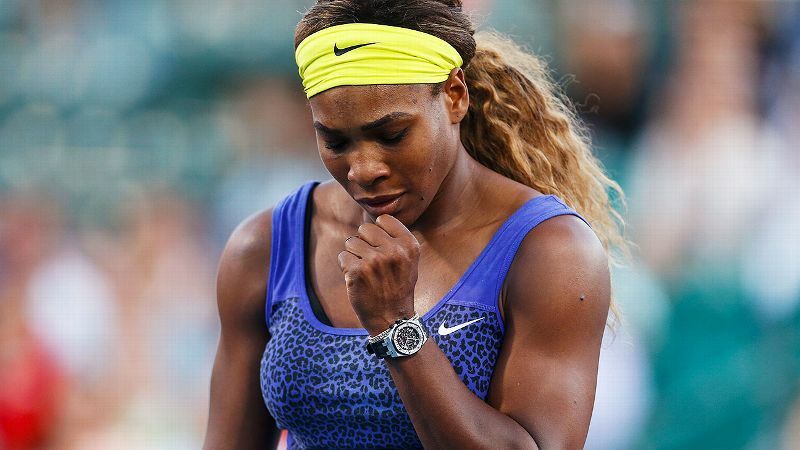 Serena won the first three games of the second set and cruised to a convincing victory. What she does best is tennis, though she was better at it last year. After one of the best seasons of her career in 2013, this has been a somewhat disappointing year for Serena, who turns 33 in September. She has won three lesser tournaments but has struggled in the Slams, failing to reach the quarterfinals in any and being eliminated in the second round of the French Open and the third round at Wimbledon. But now she's back on hard courts and ready to move on. The U.S. Open starts in less than four weeks. Hopefully, there will be no baffling and disturbing viral illnesses there and Serena is back on track to successfully defend her 2013 title. And if not, well, who wouldn't mind another side trip to Croatia?